I couldn’t pass up this adorable little aqua baby shirt at .99 cent store the other day!! 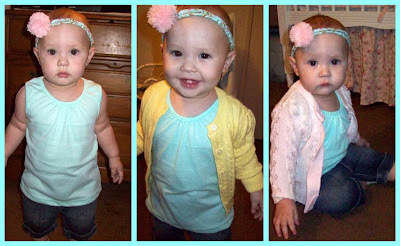 She started walking at 9 months!! for featuring my Mod Podge Paper punch Earrings Today!! She has such an awesome blog!! If you havent been there yet pop on over and say hello and stay awhile! If your crafty i know you will love it! Dont forget to enter our current giveaway!! « ♥ CSN $40 gift certificate giveaway!! ♥ Closed! What a score!! And could your little one get any CUTER???!! What a dolly! Oh she is sooooo pretty. 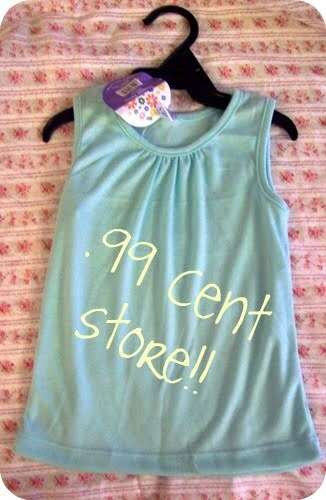 99 cents!? So good. I love the pom pom detail! I started walking at that age too! My mom said it was the weirdest thing. Is she a doll or what! Love it! I tried to take picture of the garland at our party…it made the party even more special…but I couldn't get any good pictures of it! thanks for the idea though! The party was so fun! oh, look at the little peanut-on-the-go! hopefully your package will arrive any day now! hope you likey! She is so adorable! Love the outfits!